This 32 ACP cartridge from PMC’s Bronze line of ammunition sports a 71 grain projectile. 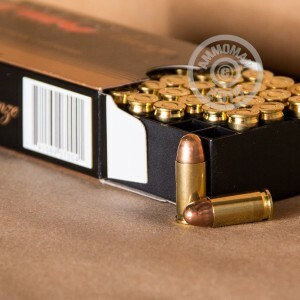 Its bullet’s full metal jacket suits this round perfectly for training and target practice, as it will prevent the rapid accumulation of lead residue in your pistol’s bore so you may enjoy more accurate shots in between cleanings. Its bullet’s round nose, along with its 900 fps muzzle velocity, means that this round will deliver superior impact energy and penetrate targets reliably as well. 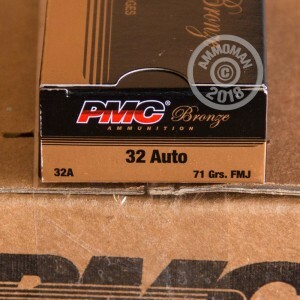 PMC’s Bronze brand offers great performance for prices that won’t compel you to shorten your visits to the range. 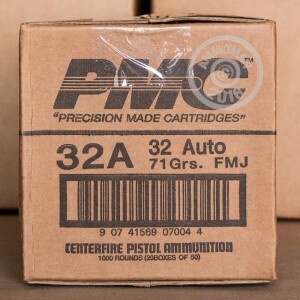 All PMC ammunition is produced according to either SAAMI or US Military Specification standards, and is loaded in factory fresh brass casings with non-corrosive Boxer primers. Because PMC manufactures all of their products’ components in-house, they have practically total control over their ammunition’s quality. That quality becomes truly evident as you fire shot after shot. For the nit picky. Reliability high, reload ability maybe not as well. PMC brass wouldn't fit my auto prime tool. Other brands fit fine, PMC groove is smaller and not as deep. I won't buy PMC 32 auto for reloading. Their other ammo is great. PMC HP jamed my Walter PP, but this FMJ funtioned perfect. The PMC ammo shoots well in a Beretta Tomcat 3032. No FTF or FTE and seems to be a very clean ammo for shooting.